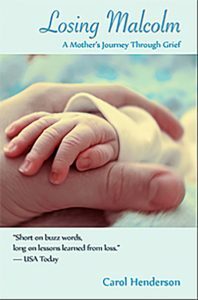 Recently I read a terrifying memoir about a mother’s loss of her baby, Losing Malcolm by Carol Henderson. The book takes me on a journey of primal fear. First, I ride her wave of unbridled hope for the new life growing within her, culminating in the otherworldly surge of love when the baby is born. The wave crashes when he is diagnosed with a life threatening birth defect. The surgeons lift her spirits from the depths of despair by offering hope for a rare risky neonatal open heart surgery. Long ago, I stopped exposing myself to fictional horror. Stopping monsters just isn’t worth the emotional turmoil. Now I ask myself why am I willing to accompany an author on her real life horror. To answer that question, I compare the two types of emotional journeys. In both forms of storytelling, the evil is too great to be stopped by ordinary people. Additional help must be recruited. For example, when aliens from another galaxy invade earth, the military mobilizes. Eventually the military wins, the killing stops, and order is restored. In the tragic memoir, Losing Malcolm, the “villain” at first is death. If the baby’s defective heart cannot be repaired, all hope is lost. The specially-trained heroes are called in. But when the risky heart surgery fails and the baby dies, the enemy instantly shifts. Death is no longer the enemy. Now, the antagonist in the story is despair. Despair threatens to destroy the main character’s sanity, and disrupt her grip on the very meaning of life. The psychological horror of despair threatens to unravel everything. To defeat despair the hero must journey back to wholeness. By now, I have read many grieving memoirs. Throughout each one, I keep turning pages, accepting the hero’s pain as the price I pay for the generous, uplifting ending. The victory at the end of Losing Malcolm is the psychological realignment of the hero’s attitude and direction, so that she is able to absorb that tragedy and move back into a world that once again makes sense. By my willingness to walk hand in hand with an author who has been to the depths, I am also treated to the pleasure of that author leading me back into the light. The pleasure of reading Losing Malcolm is enhanced by excellent story construction, a compelling writer’s voice, and a sprinkling of powerful inline excerpts from the author’s contemporaneous journals. These passages heighten the sensation of being right there with her. Good writing can’t remove the pain, but it does let the story reach deep into my heart, while I remain safely in my comfortable chair. Reading memoirs has enhanced my appreciation for the many aspects of being a human being. By learning from each author’s journey, I become a deeper person with a greater range of understanding for the complex experiences my fellow humans must undergo. When I close one of these books, I feel not only wiser about the presence of evil in the world, but also about the uplifting power of courage and hope. What situation in your life brought you so low you felt there was no point in going on, or you didn’t think you had enough sanity to even survive? Write an overview of the situation. Write a scene that shows your despair. Write another that shows your journey back to hope.